LAKESIDE, Calif. -- Historians say the Barona Band of Mission Indians have lived in Southern California for more than 5,000 years -- roaming as a nomadic tribe, learning to feast on the bounties and nature of the land. Since 1932, when each tribe family was issued one wagon, five cows, and two horses, they have lived on the Barona Indian Reservation in the rugged, rolling foothills outside San Diego. Today the travel golfer can come enjoy the award-winning Barona Creek Golf Club, and relax and gamble at the new $260-million Barona Valley Ranch Resort and Casino, designed to mirror the ranch-style architecture of the 1930s. It's an interesting, short 30-mile drive from downtown San Diego. The road winds through sage, chaparral and oak trees and atop boulder-covered peaks to Wildcat Canyon Road. Here, at an altitude of 1,500 feet, park the car yourself or use the valet. Best of all leave behind the rat race of the city. 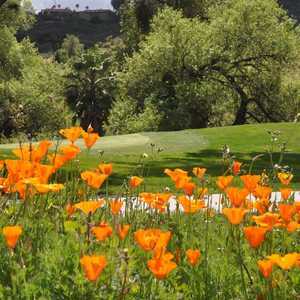 Designed by project architect Todd Eckenrode, while with Gary Roger Baird Design International, Barona Creek opened in 2001, and is a minimalistic 7,088-yard par-72 test that is one of the best in California. "We wanted to make Barona Creek the best in the San Diego area," said Eckenrode, who has since formed his own company named Origins Golf Design with partner Charles Davison, based in Irvine. "We looked all over the area and saw many artificial, over-the-water type courses. We wanted a natural look -- generous landscapes with broad views, native grasses, oak trees, use of the rock formations and we wanted it to be lean and mean." Lean and mean is a philosophy of fast and dry. Hard to do during the overseeding and wet conditions of this past February and California's rainy season. But most of the year it is possible. And it is a philosophy purists of the game crave. What has surprised Eckenrode is that high-handicappers have commented to him how they like old-style golf that features holes where you can run the ball on the green. 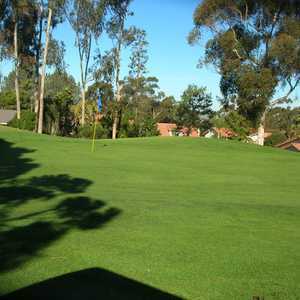 Many courses in the San Diego area don't give you the chance. Difficult greens are surrounded by bunkers, making the average player hit a high, soft shot on every hole. A perfect example is No. 3, a 260-yard par-3 from the black tees. For an 18-handicapper with a 3-wood in hand from 215 yards out, this is important. "No. 3 has a kick slope -- it's strong and long with sides and a front that promotes the ground game," Eckenrode said. "The purists understand this part of the game, and better players are able to go out and hit punch shots and recognize that they can run it on and use the slopes. Tony Ristola, a golf-course architect based in Europe agrees about the third hole. "I really liked the run-up ideas behind No. 3 and the fall-away ingredient in the 171-yard seventh with the strong bank along the right," he said. "The par-3s were the strong suit of the course." Barona Creek has lots of variety -- wide fairways, 100 multi-fingered bunkers, a naturally-fed stream and 170 mature native oaks were transplanted. The unique tee makers are replicas of cattle brands found in the area. One oak is stationed in the middle of the fairway on the par-5, 541-yard first hole to force a decision. On the day Notah Begay played at Barona he said the greens were faster than many he sees on the PGA Tour. Since opening, a variety of tour pros have come out to play here including Dave Stockton Sr., John Schroeder, Chris Riley, Phil Mickelson, Scott Simpson and Lon Hinkle. 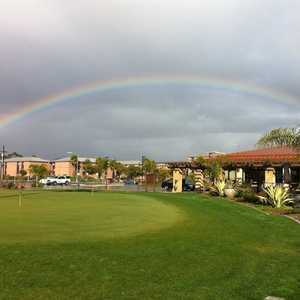 Barona Creek is also the home course of the San Diego State golf teams. Barona Creek is easily a top 10 course for California and the golf and hotel are bargains compared to many area resorts. It's a must-play when you come to San Diego. Why do Southern Californians need to drive to Las Vegas when they have Barona? This sprawling ranch-styled resort has eight stories and about 400 rooms. It is casual and rustic but modern and includes the latest amenities such as full-service Business Center, on-site limousine service, and 24-hour in-room dining. Pool, concierge lounge, fitness center and sundries store also adds to the package. Don't miss the Barona Oaks Steakhouse, a dinner-only venue that features Buffalo Tenderloin Carpaccio. Open 24 hours a day, the Branding Iron Cafe is the preferred destination for night owls and anyone with a yen for the more traditional staples of the classic American diner. The extended hours of the Ranch House Buffet, open daily for lunch and dinner, features all-you-can-eat international cuisine. When you only have a few minutes to spare, try the Food Court, where you'll find tasty and satisfying selections from Feisty Kate's Burgers & Malts, DaBoyz Original Style Pizza, and Javier's Sombrero Mexican Food, as well as Krispy Kreme doughnuts and the Barona Coffee Company's special blends.